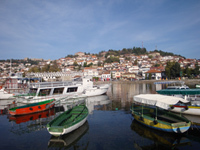 The meeting was organized with the support and collaboration of the United Nations Economic Commission for Europe (UNECE), the Global Water Partnership-Mediterranean (GWP-Med), the Lake Ohrid Watershed Commission and the Mediterranean Information Office for Environment, Culture and Sustainable Development (MIO-ECSDE), with the financial support of the Swedish Environmental Protection Agency. Upcoming activities within the Drin Dialogue. In the morning session of the meeting an opening brief statement was made by Mr. Milan Vogrin, Member of MIO-ECSDE’s Executive Bureau, in which he emphasized on MIO-ECSDE’s commitment, made at the 1st Drin Core Group, to support the dialogue at regional level, to contribute in establishing a common understanding and shared vision and in enhancing the ability and capacity of its NGO members and other collaborating NGOs in order to act in an effective and constructive way. Organization of workshops in 2011 back-to-back with the national consultations and Core Group meetings. Communication and awareness raising actions through circulars on the developments regarding the Drin Dialogue via its extensive contact lists; dedication of one issue of MIO-ECSDE’s quarterly newsletter Sustainable Mediterranean to a feature on the Drin Dialogue; reference of the Drin Dialogue in various knowledge products such as 2011 publications/web applications on public participation in the Mediterranean; presentations at meetings. The ENPI Horizon 2020 Capacity Building/Mediterranean Environment Programme (CB/MEP) which focuses on environmental integration and capacity building and aims through targeted activities within the partner countries to increase the capacities of all stakeholders (administrations – national, sub national, local authorities – NGOs, private sector, etc.) so as to effectively contribute to the de-pollution of the Mediterranean by 2020.